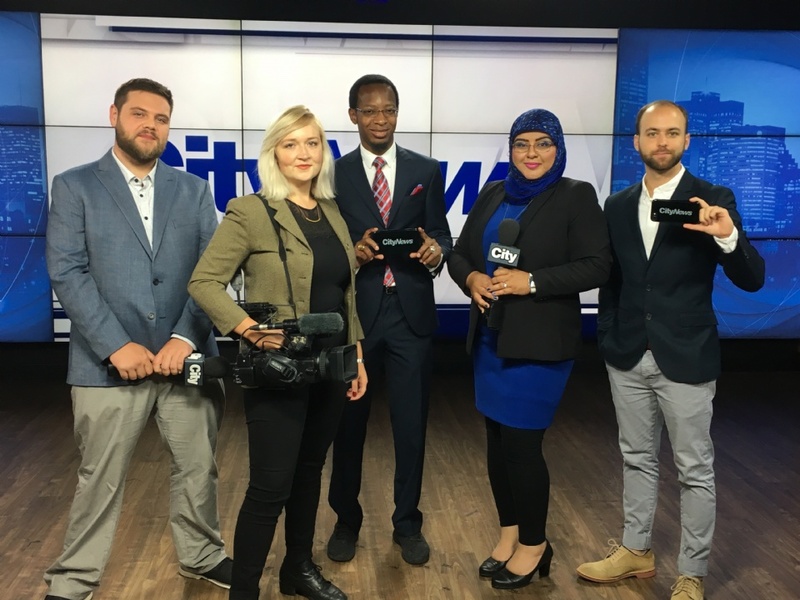 With Citytv’s launch of its award-winning CityNews in Montreal on September 3, 2018, our local community now has an excitingly fresh, hyper-local, urban take on news that is truly reflective of its viewers’ interests. Among its stellar group of video journalists are Akil Alleyne, Andrew Brennan, Emily Campbell, Fariha Naqvi-Mohamed, and Giordano Cescutti. Viewers can tune in to Citytv for one-hour broadcasts at 6 p.m. for CityNews at Six or at 11 p.m. for CityNews Tonight, stream online, or tune in through the award-winning Citytv Video App. News broadcasting is delivered in a very unique way at CityNews. The station deviates from the norm with a show that doesn’t have the usual anchor roles or a traditional news station environment. Instead, an exciting array of news reports are shot by the individual video journalists (VJs) who take complete ownership of their stories. Stories are chosen very carefully based on what viewers want to see and are delivered in a casual, conversational manner. The team prides itself on being directly in touch with the community and covering unpredictable stories that might not necessarily be covered on other stations. “The people – our viewers – are the most important part, so our stories come from them and the ideas they send us,” explains Porco. As opposed to the traditional news station that requires a massive team to bring a story to its viewers, each morning, VJs are searching for the most intriguing Montreal stories by scanning social media channels like Facebook, Instagram, and Twitter, or chatting with members of the community. Once a story that is important and relevant to Montrealers is chosen, each individual VJ does everything, from start to finish. “We do the research, we organize our interviews, we shoot ourselves doing our stand-up on the street. So, it’s really dynamic and invites the viewers onto the streets with us,” says Emily Campbell, VJ at CityNews. Since the VJs have so much room for creativity when it comes to their approach and delivery, broadcasts are always exciting and entertaining! “While shooting a story on motorcycles, I got the chance to pull up to the shoot on my own motorcycle with a camera strapped to my helmet and take people for a ride as an example of what it’s like to drive on a certain highway,” explains Campbell. Akil Alleyne – A video journalist for CityNews, Alleyne was born and raised in Montreal, has assisted with the production and writing at CBC and worked as a Research and Program Associate at the Foundation for Individual Rights in Education. He studied Constitutional and International Law at both Princeton University and Benjamin N. Cardozo School of Law. Andrew Brennan – Known for his work as a former CJAD 800 reporter, Brennan is a writer and reporter for Citytv’s Breakfast Television and CityNews. He is a graduate from Montreal’s own Concordia University, where he obtained a double-degree in Communication Studies and Journalism. Emily Campbell – Also a former CJAD reporter, Campbell is an experienced reporter whose past work has appeared on CNN. Campbell delivers captivating, viewer-driven stories as a VJ on CityNews Montreal. Fariha Naqvi-Mohamed – As a Montreal Gazette freelance columnist and well-known blogger in Montreal, Naqvi-Mohamed will be contributing pertinent stories about Montreal’s cultural communities on a segment called DiverseCity. Giordano Cescutti – With experience which includes MAtv, Montreal Gazette, and CJLO 1690AM, Cescutti was most recently a co-host and producer of the award winning sports talk show The Starting Rotation. He holds a Bachelor of Arts degree in Journalism from Concordia University and received the Sportsnet Scholarship in Sports Journalism for excellence in journalism and sports reporting. Cescutti is also among the five CityNews VJs. 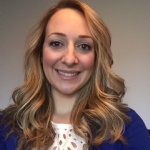 Melanie Porco – A former Lavaler, Porco is the Supervising Producer of Breakfast Television and CityNews. She has been with Citytv Montreal since its launch of Breakfast Television in 2013. Other well-known players contributing to the CityNews team are Joanne Vrakas, Catherine Verdon-Diamond, Derick Fage, and Elias Makos. You can also watch these names during other Citytv segments, like Breakfast Television. 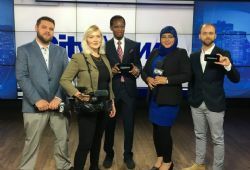 According to a 2017 Rogers Media press release, CityNews has been globally recognized as a trailblazer for news innovation and has earned accolades for its local broadcasts. Among these awards are the RTDNA National Bert Cannings Award for Best TV Newscast in a Large Market in 2016, and the RTDNA Adrienne Clarkson Award for Diversity in Reporting, earned by CityNews reporter Cynthia Mulligan in 2017. The CityNews team knows exactly how to bring Montrealers the hard-hitting stories from across Canada, but also delivers the intensely local stories the community needs by constantly keeping their ear to the ground. “Local news is where people have the most power within their community. 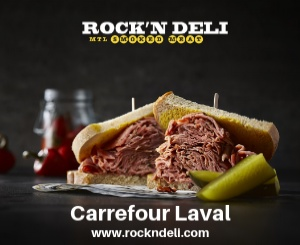 So, to have a healthy local news scene in Montreal is so essential,” says Campbell. Members of the community have been tremendously touched by the thoughtful work done by the CityNews team. Porco discussed a recent broadcast delivered by Cescutti regarding a former RCMP officer who is now dedicated to providing karate lessons to special needs children. “The officer wrote back to us the day after the story aired thanking us for shedding a light on her program and how important it is to talk about these issues,” says Porco. The CityNews team is working to bring an alternative, an opportunity and a voice to community members who may have felt excluded from mainstream media coverage. Budge explains how younger age groups are usually very engaged globally, but local media, too often, does not engage these younger members of the community. “I think it’s important for everybody in the community to feel connected to their community. It’s great to think globally, but one has to understand where one lives and understand the different perspectives of those living in their community,” states Budge. Remember to tune in at 6 p.m. for CityNews at Six and at 11 p.m. for CityNews Tonight, or stream online through the Citytv Video App for a unique perspective on the local and national stories that matter most. For more information on Citytv, visit https://montreal.citynews.ca/. 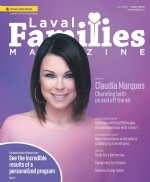 Maria Tutino was raised in Laval and is now a resident of Blainville. 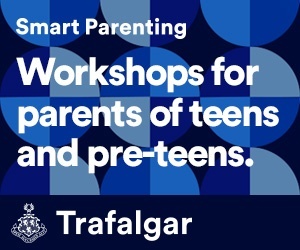 As a freelance journalist, she writes on topics of interest to parents, such as education, parenting, and health. 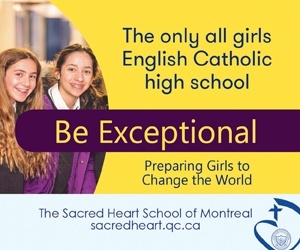 She holds a Bachelor of Arts from McGill University, with a major in Mathematics and minor in Education, and also a Master in Teaching Mathematics from Concordia University.